The coastal communities of Hampton and Seabrook are increasingly vulnerable to climate-driven threats such as erosion, storm surge, and sea level rise. Sand dunes play an important role in buffering the coastline from erosion and flooding; however, use and development of the dunes has resulted in the current dune extent constituting a small fraction (16%) of the historic distribution. The dunes that remain face continued pressure from storm surge, dune die-off, and trampling of beachgrass by users of the area. 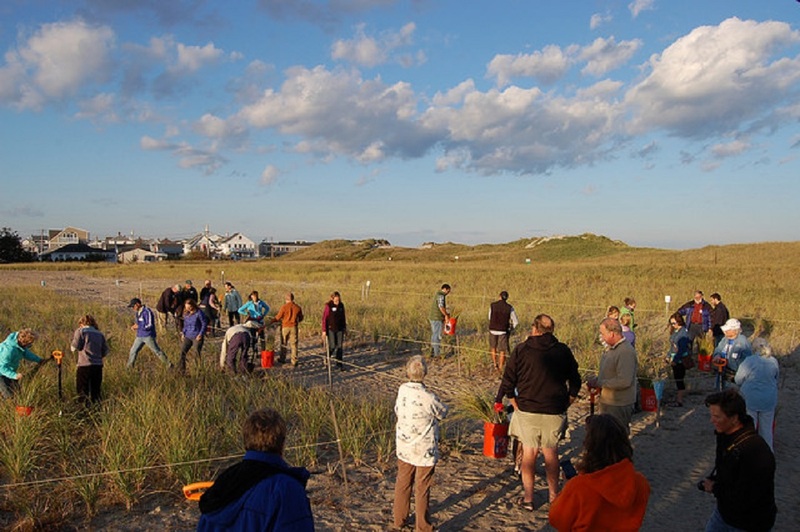 In 2015-2016, a community based restoration effort supported by the NH Coastal Program was initiated. Building on the successes and lessons learned from that project, this project will expand and refocus restoration and planning efforts to identify and address existing vulnerabilities in the communities of Hampton and Seabrook. This project continues restoration work in the same areas as the first phase of work and expands restoration work into Plaice Cove in Hampton, NH.